Welcome to Northeastern Washington, a rugged yet fascinating part of Washington State that is rich in the history of the Old West mining era and that so vividly echoes the powerful punch of a miner’s pick and the roaring boom of yet another dynamite blast—sounds that signaled the feverish search for the richest veins of gold and silver on earth. Follow the paths of miners and prospectors; walk in the footsteps of thousands of faceless adventurers who sought their fortunes in the dark and explosive atmosphere of black powder and candlelight. Visit Northeastern Washington State, step into history, and dig into the past! Many people imagine Washington as a rainy, cold place with lush rain forests, glaciated volcanoes, tall evergreens, and a population made up mostly of latte-drinking aerospace and computer nerds. In fact, Washington is in many ways a place of two worlds. While much of western Washington meets the above description pretty well, the east side of the state is rather different. Separated from the western part of the state by the majestic Cascade Mountain Range, eastern Washington is arid, warm, and reminiscent of the Wild, Wild West. The lonesome highways of the region pass by tumbleweeds, canyons, coyotes, and free-range cattle. Stampedes, Native American encampments, rodeos, pack trains, cowhands, and other Old West traditions are still the way of life throughout much of this part of the country. So the next time you hear people talk about Washington State, remember us cowboys! When gold fever struck the American West during the late 1800s, the Okanogan and Methow valleys shone as a middle link in a glittering, beckoning chain that stretched from California to Alaska. In 1849, a strike at Sutter’s Mill in the Sierras kindled the gold mining frenzy. Ten years later, the procession of gold seekers trudged north through Northeastern Washington, headed for rumored riches in Canada’s Cariboo country. Many looked for a likely lode along the way. By the late 1890s, the quest had led most prospectors farther north, to the Yukon Territory. Some Okanogan stragglers succeeded, leading promoters to label this area the “El Dorado of the North.” Hence, from 1896 until the Great Depression, gold business boomed, and within a few short months the mountains were dotted with mining camps sporting names like Ruby, Conconully, Barron, Nighthawk, Loup Loup, and Loomis. The Methow Valley shared in the wealth. The search started easy here, with stream panning and placer operations, but soon got down to hard-rock drilling and blasting. Chinese placer miners were among the earliest to try their luck along the lower Methow and Columbia rivers, beginning around 1860. The “China Ditch,” built from a point three miles upstream on the Methow River to today’s Pateros, trapped modest amounts of flour gold, popularly known as gold dust. Chinese placer miners worked the deposits of sand and gravel that contained particles of gold or other valuable heavy minerals. Gold is the most important mineral found in placer mining. 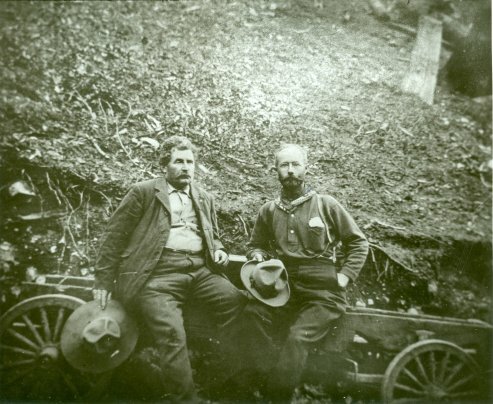 The rush up the valley may have begun in 1886, when word got out that Captain Joe White, a Methow Indian, had discovered a big gold ledge on War Creek, up the Twisp River. Squaw Creek and the Red Shirt Mine hosted the first lower-valley booms. The town of Gilbert, up the Twisp River valley, served a slew of miners during the 1890s. A bit later, the Alder Mine sprang up just south of Twisp, and that mine continued sporadic production until the 1950s, turning out a million dollars worth of metals in its lifetime. Extracting gold from the Methow’s rocky mountains was never easy. Miners seeking riches in the Slate Creek area, high in the rugged North Cascades, faced formidable challenges. The rugged terrain of the region made access difficult and hauling freight dangerous. In an average winter, heavy snowfalls caused snowslides to pour down the canyons. In some cases, buildings were demolished and miners were buried alive. This district was first discovered by west-side prospectors working their way up the Skagit River; however, because that river route was so daunting, most elected to use the Methow access route. Alex Barron arrived there first, in 1893, and discovered a “glory hole,” which spawned a roaring boom town, bearing his name, near the Cascade Summit. Supplying this hungry camp proved a boom for both the town of Winthrop and for Guy Waring, founder of the Methow Trading Company. Two years later, Colonel Thomas Hart bought an interest in the Slate Creek mines and began building a narrow-gauge (26" wide at one point) road into that district. Results of his hazardous project remain today as Hart’s Pass—at 6,200 feet the highest roadway in Washington State. Infamous Dead Horse Point along the way marks the spot where an entire pack string of horses plunged off a cliff. Brothers Charles and Hazard Ballard took over Hart’s task. They widened the road slightly, and eventually became involved with the Mammoth and Azurite mines, which continued operating through the 1930s. Many a stakeholder invested in the dream of striking it rich. Cabins were built, bridges were erected, and towns popped up. Some miners and prospectors left the hills and took up raising livestock and planting crops, seeking the more predictable riches of the earth, and so contributed not gold or silver, but settlement and civilization. As in most mining areas, the honeycomb tunnels and holes in the rugged mountains, valleys, and hills do not speak of wealth, but of lifetimes of labor and frustration. Since the early 1900s, mining has been a sporadic industry in Okanogan County. A revival led to gold production that reached $270,120 in 1940, partly because of an increase in the price of gold from about $20 an ounce to $35 an ounce in 1933. 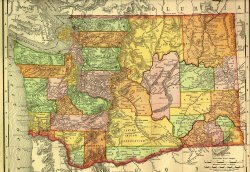 In 1903, the first year that Washington’s mineral output was recorded by counties, the Okanogan’s output of gold and silver was placed at $57,000, far less than that of several other areas, and far less than one would anticipate. The mining surge peaked in the 1890s. Glory holes yielded great sums of free gold in a short time. The surface free gold near certain ledges led to the belief that free gold would continue indefinitely. The easy pickings did not last, however, and prospectors turned to prospecting the ledges for quartz particles. There was never nearly as much profitable production as there was excitement and spending. Today, nothing but some tailings and a few decayed buildings are found where once feverish mining activity flourished on the edge of the frontier. Thousands of claims remain, from Pateros to Hart’s Pass, but almost none are being worked. No one really got rich from mining here, but the glitter of gold is what first brought folks to Northeastern Washington. The gold fever subsided here as it was breaking out elsewhere. In 1897–1898, the stampeders headed for the Klondike and into the Cariboo Mining District of British Columbia. At one point, the town of Barron emptied out, almost overnight. Alex Barron himself headed north. The mining boom towns are now part of Northeastern Washington’s rich history. 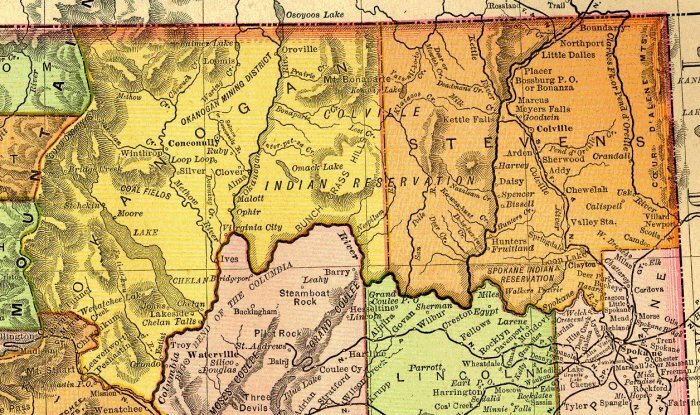 Interested in the History Of The Native American People Of Northeastern Washington Region? Click Here!